Just like that, it’s time for the stretch run of the regular season in high school basketball. Some teams only have six games remaining on the schedule. Here are some notes on the Clark County teams in the 4A and 3A Greater St. Helens Leagues. An amazing turnaround from a season ago, the Storm are on a roll leading into their next two games against rivals Camas and Union. 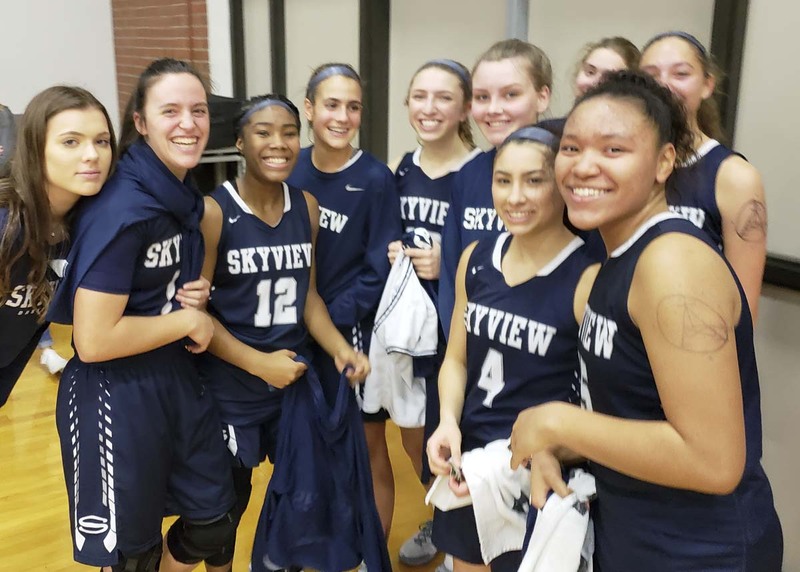 Skyview won five games last season. Now, the Storm are a favorite to win the league title. Kazz Parks is leading the team in scoring at 17.8 points per game. Emily Norton has made 58 3-pointers in 14 games. Madison Hendricks is scoring close to 12 points per game. Remi Riley, meanwhile, is leading the team in rebounds and assists. Skyview is ranked sixth in the 4A RPI. Camas is 3-0 in overtime games, plus opened league play in December with a two-point win over Union. Haley Hanson “continues to be our anchor,” the coach said, always wanting to take the big shots. She keeps coming up clutch, too, he said. In fact, there is a video making the rounds on social media of Hanson making eight 3-pointers in a recent game. Camas hosts Skyview in a battle for first place Friday. The Papermakers, even with those six losses, remain a top-20 team in the RPI. The season changed with the injury to point guard Mason Oberg, but the Titans have made strides. The scoring is balanced, with every starter leading the team in scoring at least once this season. Toryi Midland is leading the scoring at 11 points per game. She is making a huge impact on the boards, too, with a school-record 19 rebounds in one contest. McKenzie Lewis is the assist leader for the Titans. Union is No. 16 in the RPI. The Tigers are struggling to score but play solid defense. The team is young and still learning to work together and to compete 100 percent of the time, the coach said. The Tigers are sharing the workload. In the last three games, three different players have led the team in scoring: Megan Geiger, Brianna Adams, and Mallory Meyer. “The biggest takeaway from the first half of the season is that we must do a better job of handling pressure and cut down on the number of turnovers,” Heritage coach Jacob Kaler said. “We had a challenging pre-season schedule that allowed us to go up against a variety of defensive styles. I’m happy with the progression we have made since the start of the season. Katie Peneueta is a double-double machine, averaging 17.4 points and 14.7 rebounds per game. She also blocks six shots a night. Bri Gould is second in scoring, coming in at 11.7 points a game. 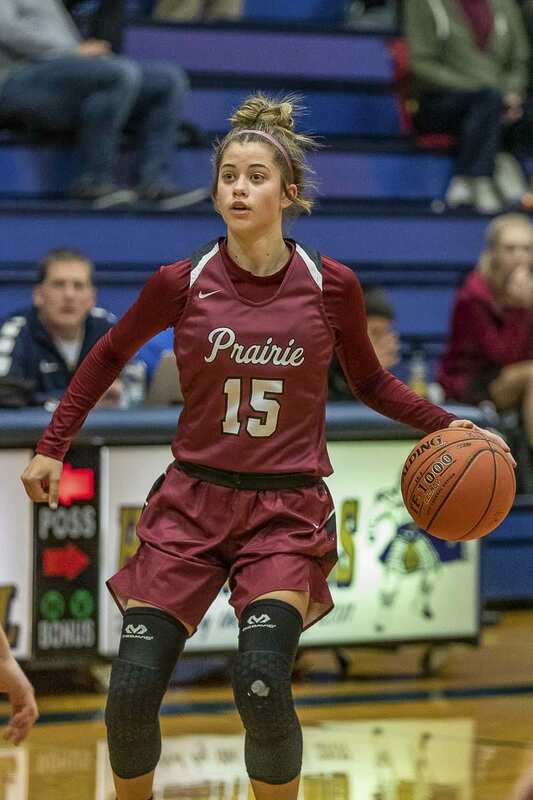 A case can be made that Prairie has the best shot of any basketball team in Clark County to win state this season. And yes, that is the goal. The team’s three seniors are all four-year varsity players. The juniors have played or practiced varsity for three years. A ton of experience. Prairie has played its toughest non-league schedule in years. The only loss came against a nationally recognized program in a tournament in California. Corral said statistics can be misleading for this team. The Falcons do not have any player who will shoot 20 times a game because they have at least seven proven scorers. Instead, it’s a balanced attack. Cassidy Gardner is averaging 14.9 points per game. Brooke Walling is at 12. But again, any Falcon can have a huge performance on any given night. Walling leads in rebounds, Allison Corral is the assists leader, and Kendyl Carson leads the team in steals. Prairie is No. 3 in RPI. The feel-good story of the season in girls basketball? The Eagles were a .500 team a year ago, but this season have taken a big leap forward. As of today, the Eagles were No. 13 in the RPI. The team has suffered illness and injuries but still keeps finding a way to battle. Aniyah Hampton is averaging 19.2 points per game. Jaydia Martin is at 16.3, and Kamelai Powell is as 12.4. Powell, in fact, averages a double-double, grabbing 10.4 rebounds a night, too. Martin leads the team in assists. The Thunder struggled in the non-league part of the schedule, trying to adjust to many lineup changes. Injuries and illness dominated the squad for much of December. There were games when Mountain View only had seven or eight players. Still, going through that could help the Thunder in the final seven league games. They still hope for a playoff push. Jenna Carlson leads the team with 11.3 points per game. Freshman Paytin Ballard is averaging 10 points and seven rebounds a game. Ballard also leads the team in assists. The Plainsmen are having a rough go of it this season, hoping to improve in the final stretch. They have a win, plus were close in two other games. Jasmine Tiatia and Arianna Walker have led the team in scoring the past two games. As of this writing, the official 3A GSHL website lists Fort Vancouver as 0-10. We know better, though. The Trappers won a game in their own tournament in December. It was the first win for the program since December of 2016. Fort Vancouver High School girls basketball team ends long losing streak with win in tournament.